Here it is... The World Famous "Water Bobble" for Pools & Spas! When properly placed in the skimmer, the Water Bobble, removes contaminants right off the surface. Stopping the Bacteria laden Dead Skin, Body Oil, Makeup, from going round & round, within your circulatory system. The majority of the Dead Skin, will collect on the Zorbie, rather than congeal on your filter. "Water Bobbles" last 30-90 days or until they settle low in the water, depending on bather loads. A. Weakly bound, singly charged (monovalent) ions such as sodium and chloride are continually displaced. 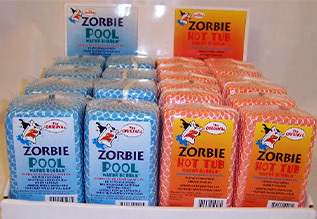 More highly charged, doubly charged (divalent) ions such as sulfate, ammonia or phosphate replace them, throughout the life of the Zorbie Hot Tub & Pool Bobbles. It is ammonia that creates a growth environment for bacteria. After hours appointments are available upon request.